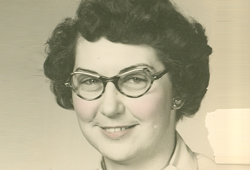 The Verdabell Plank Miller Memorial Endowed Scholarship in Teacher Education, in honor of her lifelong commitment to the love of education, was established through a bequest from her estate. Verdabell served as a role model of teaching excellence throughout her career in Richland County Ohio. This award is an expression of Mrs. Millers gratefulness for the education she received while at Ashland College and for her lifelong immersion in and commitment to education. She was an inspiration to her students and their integrating into their own lives her love of learning. It is the expressed wish of the Miller family to see that students from Richland County receive the opportunity to have the greatest choice possible in pursuing their educational dreams at Ashland University.